The Jaguar XJS has headlights which are trapezoidal, but get called many things when it comes to their performance. Their design creates a poor beam pattern, and when the headlights are made more powerful, this can exaggerate the problem. Luckily, the latest LED technology makes it possible to overcome these challenges. These entirely new high power LED upgrade units generate almost three times as much light as standard, and also an excellent beam pattern in either left hand drive or RHD vehicles. Also, the colour of the light is ivory white, not blue white, so that it looks correct on a classic car. There is also a way of fine tuning the cutoff built into the design. Please note that the front sidelights stay on with the headlights and we have powerful LED bulbs which match the light colour of these headlights upgrades. They are listed separately. If you have trouble finding these, or anything else you need, just email us and we will find them for you. 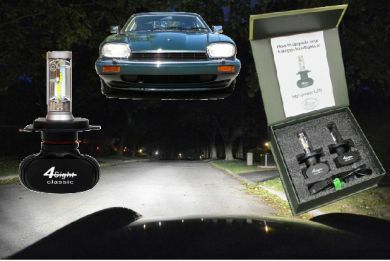 These powerful headlight upgrades also break new ground in another important way. They are guaranteed against fault or failure for a full 5 years from the date of purchase. This have never been achieved before by anyone. They also come with a money-back guarantee.